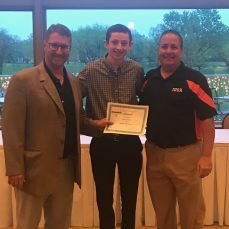 The Illinois Hockey Officials Association (IHOA) held their Annual Meeting on Monday, May 14th at the Bloomingdale Golf Club in Bloomingdale, Illinois. 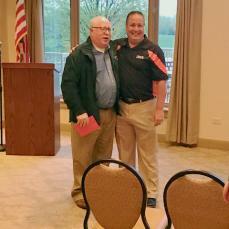 IHOA recognized Steve Drews who announced his retirement from the IHOA board. Steve has served on the IHOA board for many years in many capacities, including the position of IHOA President. Steve has also been a lifetime AHAI volunteer, donating his time as an AHAI Coaching Education Program (CEP) Instructor and Chicago Blackhawks Special Hockey Coach. Steve was recently awarded the 2018 AHAI Disabled Hockey Coach of the Year Award and is also an AHAI Service Award recipient. Both IHOA and AHAI will miss Steve’s tireless dedication to the sport of ice hockey. 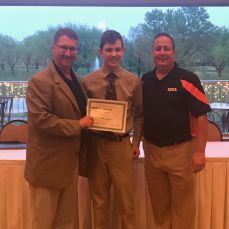 Additionally, the annual IHOA scholarships were awarded to two student officials who exhibited in school, on the ice and in their community the true spirit of USA Hockey, AHAI and IHOA. IHOA congratulates Charlie Foster and Alex Mucha and wishes them good luck in the next chapter of their lives.